Have a look through our FAQs, and feel free to contact us with further hotel or booking inquiries. We are located 1/2 mile north of the Orlando International Airport. Going north from the airport, turn right on TG Lee Blvd. Go to first stop sign and turn right on Augusta National Drive. Hotel will be on right. For map and more detailed directions, visit our Contact Us page. Can I smoke at the hotel? For the health and comfort of all of our guests, the hotel is smoke-free. Complimentary on-demand airport shuttle service is included with your reservation, and can be arranged from the airport or at Guest Services Desk in the hotel lobby. We can also arrange transportation to and from Port Canaveral (see our Hotel/Transportation package for a special deal for cruisers). Our staff at the Guest Services Desk can handle restaurant reservations, car rental, GPS rental, laundry and dry cleaning service, excursions and shuttles to the airport and area attractions. Tickets to most area attractions and dinner theaters may also be arranged. 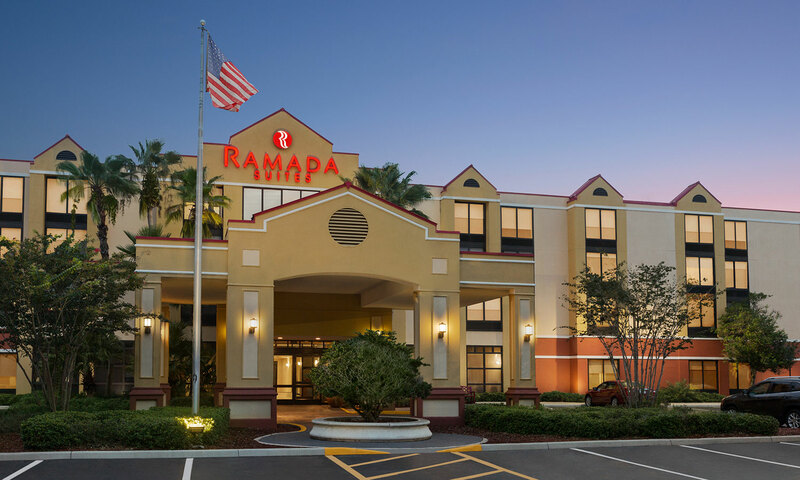 The Ramada Suites Orlando Hotel is within easy walking distance or short driving distance to several restaurants, including Cracker Barrel, Bonefish Grill, Longhorn Steakhouse, Chili’s, Sonny’s BBQ, Denny’s, Hooters, Tony Roma’s Fire and Grill Lounge, TGI Friday’s and more. Where can I keep my passport, money and other valuable? We provide room safes at no extra charge. Unfortunately, for the health and comfort of all our guests, we do not allow pets except service animals. Service animals must show proper registration information. Hotel will charge $250 pet fee if pet found on premises. We have several ADA-compliant rooms for guests with disabilities, provided on a first-come, first-serve basis. Yes, both items are included free in all of our rooms and suites, along with a coffeemaker, iron, ironing board, hairdryer, radio alarm clock and safe. To view all of our rooms and suites, please take a look through our photo gallery. There is free parking at the hotel. Please look into our Park, Stay and Fly package for guests requiring parking while out of town. Yes, we offer self-serve laundry facilities. Guests needing valet dry cleaning or laundry services may contact the Guest Services Desk. Yes, our fitness center is open from 6 a.m. to 10 p.m. daily and features a treadmill, Elliptical machine, a stationary bike and a universal weight machine. Our hotel features a full business center and meeting spaces as well as high-speed Wi-Fi service at no charge. Does the hotel have high-speed Internet access? Complimentary Wi-Fi is available in all guest rooms and throughout the hotel. Does the hotel have Bell services? Bell services can be prearranged for groups; however, there is no Bell Stand in the lobby. Luggage carts are available for guest use and baggage may be stored in our storage room if you arrive before your room is ready, or have a late flight. To avoid a cancelation fee, your reservation must be canceled before 6 p.m. the day before your arrival. The cancelation fee is the cost of the first night, plus tax. How big are your rooms? Our standard room is approximately 300 square feet. We have a very limited number of connecting rooms. Please contact us or inquire at the front desk. Do I need do guarantee my reservation? Yes, all reservations must be guaranteed with a credit card. We accept Visa, MasterCard, American Express, Discover, and Diners Club International. What the check-in and check-out times? Check-in is at 4 p.m., check-out is by 11 a.m. We offer a courtesy check-out by 12 p.m. Later check-out is available, although a fee may apply. How many people fit in one room? The maximum number of occupants in a Double Room is six. Three occupants are allowed in our single King rooms, and four occupants are allowed in our deluxe king rooms with a pullout sofabed. We do not offer rollaway beds. We provide a room service partner through Order Inn from 11:00 a.m. to 11 p.m. A full complimentary hot American breakfast is served onsite daily from 6 a.m. to 10 a.m. and our Gift Shop is open 24/7.